The Union Pacific Railroad bought 45 4-8-4s in three orders from the American Locomotive Company. The first order of 20 locomotives (road numbers 800 through 819) was delivered in 1937. 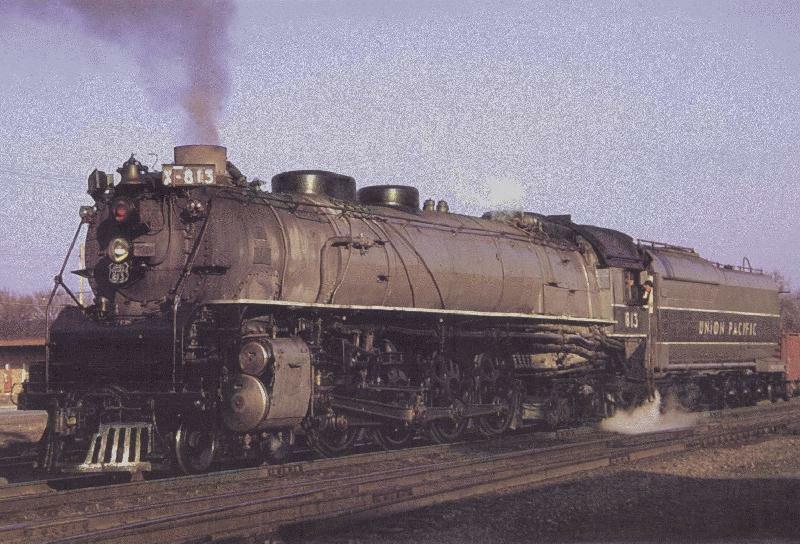 These were designated Class FEF-1 and were designed by UP's Motive Power Group to have 77" drivers, 24.5 x 32 cylinders, a boiler pressure of 300 psi, and a weight of 465,000 lbs resulting in a tractive effort of 63,611 pounds (63,800 nominal). The second order of 15 locomotives (road numbers 820 through 834) was delivered in 1939. These locomotives were designated as Class FEF-2. They were designed to have 80" drivers, 25 x 32 cylinders, a boiler pressure of 300 psi, and a weight of 483,000 lbs giving each a tractive effort of 63,750 pounds (63,800 nominal). The last group of 10, Class FEF-3 were delivered in 1944 and were assigned road numbers 835 through 844. These FEFs (Four-Eight-Four) were designated Class FEF-3 and were very similar to the Class FEF-2's. The UP 800 Four-Eight-Fours saved UP $300,000/year in costs. The purchase price for these engines was $150,000 in 1944 dollars. The 800s ran about 14,000 miles per month. Today these engines would cost around $10-11 per mile. The 800s cast-steel locomotive frame which replaced many separate parts by one single casting helped maintenance. Information provided by Dan McNaughton. There are four surviving UP 4-8-4s: number 814 in Council Bluffs, IA; number 833 which was recently moved from Pioneer Park in Salt Lake City, UT to the Ogden Union Station Museum in Ogden, UT; number 838 at UP engine house in Cheyenne, WY and number 844, which is operational, also at UP engine house in Cheyenne, WY. Data from UP 11 - 1946 Locomotive Diagram book supplied in May 2005 by Allen Stanley from his extensive Rail Data Exchange. (Many thanks to Chris Hohl for his 30 May 2016 email noting the original tender design and supplying builder's cards for all three FEF batches.) Works numbers were 68808-68826 in August 1937, 68827 in September. These engines were worked hard in service and responded exceptionally well. They were fitted with unusual tapered main and side rods, which reduced the mass of steel out at the end of the rotary motions. In addition, each wheel crank pin had its own sleeve bearing, which reduced the strain on the main crank pins on each side. These engines were reported as frequently running at above 100 mph (161 kph). They arrived in three batches, two (FEF-1 & FEF-3) which had Type A superheaters. These are shown in this entry (FEF-1) and Locobase 8340 (FEF-3). This first set had the smaller drivers (77") and a boiler pressed originally to 260 psi (17.9 bar). Leading and trailing truck roller bearings were supplied by SKF while Timken produced those for the driving axles. FEF-2s had the Type E superheater, which resulted in a very different boiler layout; see Locobase 284. Delivered as coal burners as shown in the specs, the FEFs were converted to oil burning in 1946. The firebox heating surface area decreased by the elimination of the 57 sq ft (5.3 sq m) of arch tubes. Tender water capacity remained the same, but the 25 tons of coal was replaced by 6,550 US gallons (24,792 litres); loaded weight, carried by two 3-axle trucks, rose to 384,350 lb (174,338 kg). After diesels bumped the big oil-burners from passenger service, they turned their 80" drivers to freight work. The first was retired in 1954, the last in 1961. Data from UP 11 - 1946 Locomotive Diagram book supplied in May 2005 by Allen Stanley from his extensive Rail Data Exchange. (Many thanks to Chris Hohl for his 30 May 2016 email noting the original tender design and supplying builder's cards for all three FEF batches.) Works numbers were 69161-69165 in August 1939, 69166-69172 in September, 69173-69175 in October. Delivered as coal burners as shown in the specs, the FEFs were converted to oil burning in 1946. The firebox heating surface area decreased to 442 sq ft (41.06 sq m) through the elimination of the 57 sq ft (5.3 sq m) of arch tubes. Adhesion weight dropped to 265,200 lb (120,293 kg) and loaded engine weight decreased to 478,640 lb (217,108 kg). The original tender rolled on a leading two-axle truck and a five-axle setup. The later tender had a single leading axle and a six-axle system. Tender water capacity increased to 23,500 US gallons (88,948 litres) and the 25 tons of coal was replaced by 6,000 US gallons (22,710 litres); empty weight of the seven-axle tender (five axles in a centipede setup and a two-axle leading truck) was 171,360 lb (77,728 kg) and loaded weight rose to 416,320 lb (188,840 kg). The railroad bought ten more FEFs in 1944; see Locobase 8340. As the railroad dieselized in the 1950s, the FEF-2s gradually left service. The first was retired in 1956, the last in 1962. Data from UP 11 - 1946 Locomotive Diagram book supplied in May 2005 by Allen Stanley from his extensive Rail Data Exchange. (Many thanks to Chris Hohl for his 30 May 2016 email noting the original tender design and supplying builder's cards for all three FEF batches.) Works numbers were 72782-72791 in December 1944. When World War II traffic levels over-stressed the existing UP passenger-locomotive stud, the railroad returned to Alco for ten more of the FEF design. They might have preferred to buy diesel sets, but those were not available. Instead, Alco produced engines with the power dimensions and driver diameters of the FEF-2 (Locobase 284) under a boiler virtually identical to that of the FEF-1 (Locobase 8339). One difference was the use of a double stack. And like the FEF-1, SKF supplied the leading and trailing truck roller bearings while Timken produced those for the driving axles. Although delivered with 69.5 sq ft (6.45 sq m) of circulators and arch tubes, these were removed in1945 as part of a conversion to oil burning in 1946. The firebox heating surface area decreased to 442 sq ft (41.06 sq m). Adhesion weight dropped to 266,490 lb (120,878 kg) and loaded engine weight decreased to 486,340 lb (220,600 kg). The centipede oil tender, now carrying 6,000 US gallons of oil, weighed 421,500 lb (191,212 kg). The last of the class - 844 - never actually left service. Its 1957-1959 stint of freight work was its last revenue work, but it was reserved for excursion work in 1960. Renumbered for a time as 8444, the locomotive regained its original number in 1969 after the diesel that bore 844 was retired. It was reassigned to excursion work and ran into the 21st Century. The other nine were all retired in 1957-1962.